"The Fix" is the latest in the Minnesota Opera's long running endeavor to bring new and distinct modern voices to an art form often seen as antiquated. It tells the story of the 1919 Chicago "Black" Sox, who conspired to lose the World Series in exchange for payoffs from a gambling syndicate. It's a dark chapter in the national past time's history, one that claimed the careers of both rookies and veterans, wise souls and dumb kids. It's a great story and boasts a tremendous score, cast, and design. It is Game 7 of the 1991 World Series at the Metrodome. Members of the Twins (Knoblauch, Hrbek, Puckett, Morris, Kelly, and chorus), sing of the tension, the drama and the hope of the game as it enters the bottom of the 10th and Dan Gladden doubles to lead off the inning. 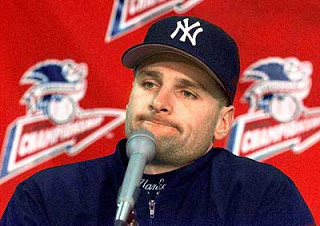 Chuck Knoblauch returns to the dugout after bunting Gladden along and laments that his best contribution in this pivotal game would be just a bunt. At this moment, Nike enters to offer Knoblauch a vision of the future. As she sings, she paints him a picture of the future where he is a great player, an all-star, a local legend, (and the recipient of a lucrative endorsement with a sports apparel brand that shall remain nameless). However, he can only have this if he is willing to suffer with the team and the fans. As the winning run scores, Knoblauch agrees to the deal. July 1997, Knoblauch enters the clubhouse alone and rages at the emptiness. The team has lost again and his patience is running thin. In the show's central aria he sings of his despair as fleeting images appear before him and the audience. He mourns his ailing father, remembering and mimicking a game of catch long past. His memories take him through the farewell songs and cheers for teammates past (Puckett, Morris, Hrbek). He cannot understand the love and support they receive despite their failings (on the field and off) while he carries on alone. Desperate, he cries out to Nike to release him from his pledge, to let him feel joy on the field again, and to bless him with the chance to play for a winning team. Nike appears to take mercy on him, but warns him of the consequences: his play will decline, his status will fade, and he will lose his legendary status if he leaves now before the vision comes to pass. Unable to take it anymore, Knoblauch pleads to be released from his bonds, and is granted them in the form of a Yankees jersey. May 2 2001: Returning to the Metrodome field 10 years after we last saw it, Knoblauch hears the echoes of his old rage, but directed at him from the chorus in the bleachers. He stands alone in Left Field singing a quiet song of isolation and annoyance as garbage, batteries, and hot dogs surround him. Tom Kelly briefly appears to offer him condolences, but Knoblauch only wishes fans would get over it as the garbage builds to his knees. Nike appears, on her way to sing to Jeter, and reminds Knoblauch of the promise he broke to her. Knoblauch scoffs, certain that he'd never have had support as the garbage reaches his waist. Nike provides him with a final vision: another title, the jeers turned to cheers, a statute of him by a new stadium as the young players drafted during bad years come of age, with Knoblauch as their mentor. Nike leaves him as the garbage continues to pile up and Knoblauch defiantly declares his strength until he is tragically buried in dollar dogs. I’ve missed your blogs! Thank you for this, as both a musician and a Twins fan. Like Damn Yankees except the other way around. I love it!